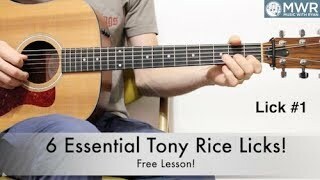 6 Essential Tony Rice Licks – FREE LESSON! This lesson features 6 essential Tony Rice licks that every bluegrass guitar player should begin to learn. If you're looking for that bluegrass guitar sound and want to add a little attitude to your playing, this is a good place to start! These licks are largely minor pentatonic driven to help give you some bluegrass attitude! You'll need to become a Free Member to download the tabs and access the full-length lesson! Join today!